A memory foam mattress for 69% off? A dinnerware set for 43% off? A cookware set for 56% off? Well, OKAY! *Actual* Black Friday is (thankfully) still very far away. But Wayfair's "Black Friday in July" sale? IT'S HERE RIGHT NOW! 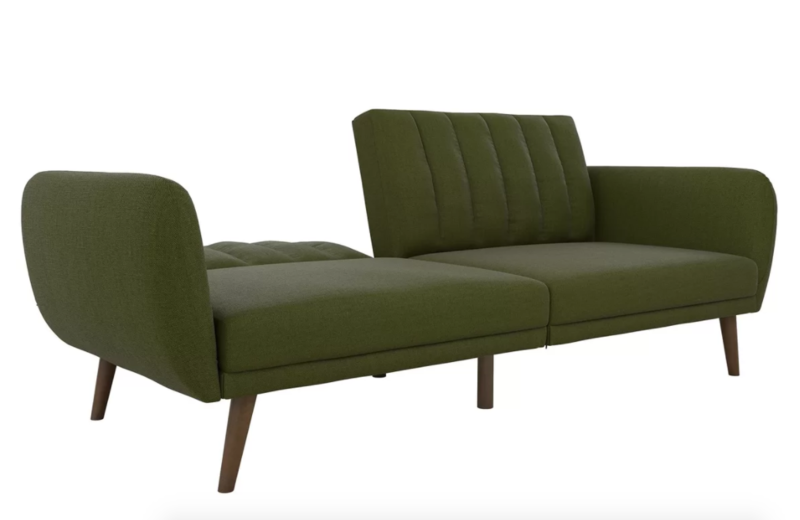 You can get up to 70% off sofas, rugs, outdoor furniture, mattresses, and more. You'll find everything that's on sale here, but we've rounded up some of our favorite products you can get at a discount below. 1. A gorgeous bookcase for anyone who will one day have a full-blown home library, but, alas, doesn't have the space just yet. This adorable bookcase will house your favorite reads without taking up a ton of space. 2. A 10-piece stainless steel cookware set so professional, it'll make you feel like Martha Stewart herself taught you how to cook. This set is dishwasher-safe and includes shatter-resistant glass lids! 3. A dark bronze panel bed stolen from Buckingham Palace. Pembroke Welsh Corgis and royal jewels sadly not included in price. 5. An elegant writing desk to transform your home office into a gorgeous space worthy of its own Pinterest board. 6. A medium-firm gel memory foam mattress with a ventilated design to regulate body temperature. In English? NO MORE SWEATING IN YOUR SLEEP. 7. A 12-piece dinnerware set made of a heavy weight material that you can stick in the dishwasher and it will STILL last forever and ever. This dinnerware set services up to four people, and includes four dinner plates, four salad plates, and four bowls. 8. A coffee table that doesn't discriminate against tea drinkers. All beverages are welcome. You're fine, Kermit. 9. A bed sheet set made from a buttery soft material that won't wrinkle or get ruined after one (1) wash cycle. Just throw out your old, awful sheets, folks. It's time. This set includes one flat sheet, one fitted sheets, and two pillowcases. 10. A three-drawer accent chest — it makes the word "quaint" come to mind. Now someone buy me a beach house, because this thing BELONGS in one. 11. A seven-piece comforter set to turn your bedroom into a five star 👏 MASTER SUITE 👏 complete with room service and a jacuzzi. 12. A six-quart pressure cooker that can make everything from pulled pork and broccoli cheddar soup to chocolate lava cake and banana french toast. Excuse me while I drool. This handy dandy instant pot comes with six preset cooking programs and automatic shut-off feature. 13. A comfy armchair credited with the rise of book sales. It's impossible to not feel the need 'ta read in this thing. 14. A WiFi-enabled air purifier with a filter that traps pet hair, lint, and pollen, as well as neutralizes orders from cooking. It removes 99.97% of airborne bacteria! 15. A wall-mounted cabinet that contains three shelves, making it the perfect way to add extra storage that isn't an eyesore. 16. A comforter set likely owned by Meghan Markle herself because this bedding is so pretty and regal, it's likely designed for a PRINCESS. This beautiful set contains one comforter and two shams, and YES — just stick it in the washing machine when it needs to be cleaned. 17. 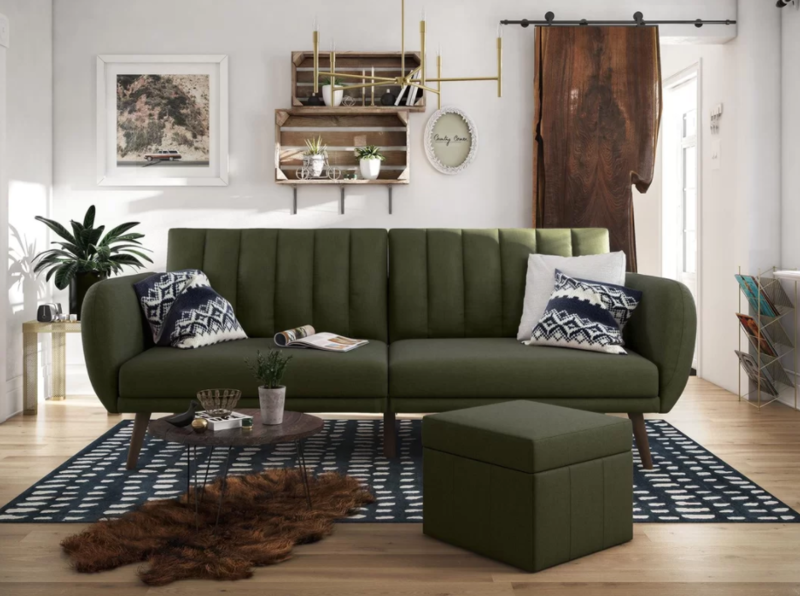 A convertible sofa perfect for the post-grad whose teeny tiny apartment needs to house the occasional guest. 18. An end table that is not actually "the end," but rather a new beginning for your home décor. 19. A tufted platform bed you shouldn't judge by its appearance: it may look ~tuff~, but is actually very comfortable. 20. A circular coffee table that your favorite coffee mug would be damn proud to rest upon. Psst, this gorgeous coffee table also comes with wheels! 21. A cat tree so great, it'll leave you saying "YOU'VE GOT TO BE KITTEN ME! THIS CAT HAS A BETTER LIFE THAN I DO!" Check out the full selection of deals here.